MICRO attended the Global Index Insurance Conference that took place in Dakar. MiCRO participated in the XVI Annual National Microinsurance Summit: Promoting Microenterprises organized by the Mexican Ministry of Economy’s National Program for Financing Microentrepreneurs (PRONAFIM) in Mexico City. MiCRO participated in the NERC/DFID/ESRC “Building resilience to natural disasters using financial instruments” panel meeting in London. MiCRO was part of the discussions in Plenary 2 , Parallel Session 6 and Parallel Session 11 at the 13th International Microinsurance Conference organized by Munich Re Foundation, the Microinsurance Network and the Asociación Peruana de Empresas de Seguros (APESEG) in Lima. MiCRO participated actively in the 11th Consultative Forum on “Scaling up insurance as a disaster resilience strategy for smallholder farmers in Latin America” hosted by the International Association of Insurance Supervisors, the Access to Insurance Initiative and the Microinsurance Network that will take place in Lima. MiCRO’s contributions to closing the protection gap were also presented at the 6th Latin American Retail Summit in Miami, a good platform to share experiences with other players interested in new and innovative services for the underserved. MiCRO participated actively in the discussions Global Action Network for Agriculture Insurance organized by the Impact Insurance Facility that took place in Geneva. MiCRO attended the event InsurTech Rising 2017 “Insurance for a brave new world”, and its Blockchain in London. MiCRO attended the First International Seminar on InsurTech organized by the Federación de Aseguradores Colombianos (FASECOLDA) in Bogota. MiCRO attended AgriFIn’s 2017 Forum on Financing Low-Carbon Resilient Agriculture that took place in London. 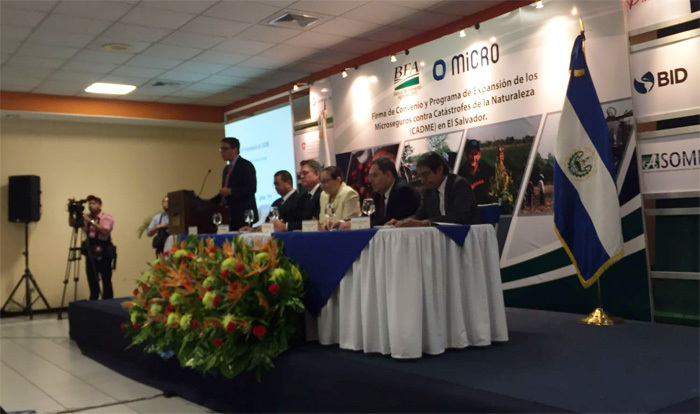 MiCRO presented its work at the Regional Seminar on Agro Insurance in Mérida, México, offered by Swiss Re to its Latin American clients. The presentation was followed by a thorough Q&A session, denoting the need for and interest in this kind of solutions. MiCRO presented at the launch of the latest Sigma publication on natural disasters, next to several other initiatives to “close the protection gap” from around the world, MiCRO’s solution was selected by the participants as their favorite in a poll.